Debt consolidation is a type of debt refinancing that involves taking out one big loan to pay off many smaller loans. The term is common in personal finance for individuals who want manage their high consumer debt. The term can however be used to refer to a country’s fiscal approach towards government or corporate debt. The main aim of debt consolidation is making debt manageable which is achieved by lowering overall interest rates on the entire debt load. Debt consolidation also makes debt manageable by offering more convenient/manageable terms for repaying the resulting loan. Debt consolidation involves taking out a loan known as a debt consolidation loan. The loan is usually taken from a different lender to pay off all your current debts combined. The loan also comes with different terms which are more favorable since the aim of debt consolidation is lightening the burden of having to service many debts. Since debt consolidation loans usually come with much lower interest rates than typical loans, debt consolidation is a viable option for you if you are servicing high interest debt such as credit card debt. Credit card debt is undoubtedly the most expensive kind of debt because of high interest rates as well as penalties which can make the debt grow to unmanageable levels very fast when you have problems repaying. If you have multiple credit card debt which has become unmanageable, you should really consider debt consolidation. You should also consider debt consolidation if it has become challenging for you to meet all your debt repayments in time. Debt repayment can become a challenge when you miss repayments and get penalized which can easily results in a new higher monthly repayment you can’t be able to manage comfortably. A sudden revision in debt repayment terms can also make it hard for you to service all your debt comfortably. Debt consolidation can come in handy in such scenarios because you get what you need which is lower monthly repayments. It’s also advisable to consolidate your debt when you it has become hard to track which payments are due because of the number of bills you get. As mentioned above, debt consolidation is all about converting many debts into one manageable debt. The process therefore gets rid of the confusion that comes with servicing many bills/loans. This type of debt consolidation involves debt consolidation companies i.e. companies which specialize in consolidating debt. 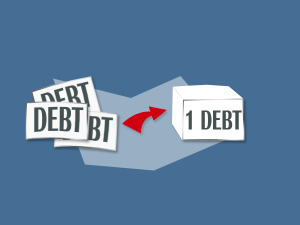 Debt consolidation companies allow their clients to take out loans from them to pay off their existing debts. As a result, all your loans are transferred to the debt consolidation company i.e. you own them now instead of owing your previous creditors. Typically, debt consolidation companies will give you very flexible repayment terms i.e. a lower monthly repayment because the companies extend your repayment period. You however end up paying more in fees and interest especially if you have a poor credit score. Considering most people struggling with debt have poor credit scores, this option is usually costly. In a nutshell, it will be more expensive but the low monthly repayments will be manageable. This type of debt consolidation allows you to borrow a loan against your home’s value. Instead of getting a loan from a debt consolidation company, you can put up your home to get a loan to cover all your loans. HELOCs are a great debt consolidation option when you have huge debt because you can get a loan that amounts to 75 to 80 percent of your home’s total value. HELOCs are different from typical home equity loans in that they don’t have fixed terms. HELOCs extend a line of credit upon which you can use at your convenience. The interest however varies although you get a lower interest rate than what you would get with typical home equity loans and many other loans out there. The downside of HELOCs when it comes to debt consolidation is that; the lender can claim your property if you don’t meet your repayment terms. It is also possible to consolidate all your debt (specifically, credit card debt) into one card with credit card balance transfer offers which usually come with a 0% interest free period for 6-12 months but you have to pay a transfer fee which is usually 2-5% of the total balance. During the interest free period, you must continue repaying the agreed amount otherwise you will lose the introductory interest offer and be forced to start making interest repayments immediately. This option simply allows you to pay a sizeable amount of your loan balance before the interest starts being factored in the repayments. As a result, your debt becomes more manageable. It is however important to note that the 0% interest period can be very tempting leading to more debt. This type of debt consolidation is undoubtedly the most recent. The option allows people to lend each other money via Peer-to-peer lending companies. The companies connect people in need of consolidation their debt with people who have some money to invest. The investor gains by getting a favorable rate of return on their investment (money lent) as well as the satisfaction of assisting someone pay of their debt. The borrower benefits by getting an opportunity to manage their debt at a lower cost since peer-to-peer debt comes with a lower interest compared to most typical loans in the market. Peer-to-peer lenders benefit by taking a small fee for their trouble. 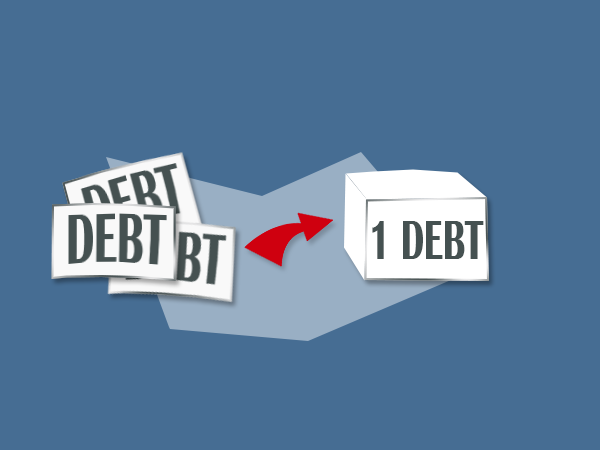 In summary the above information summarizes the most important basics of debt consolidation. After going through the above information, you shouldn’t have a problem understanding what debt consolidation is, when it makes sense to consolidate your debt and the debt consolidation options available to you. It is however important to note that there is more to debt consolidation that what is discussed above. It is therefore important to use the above information as a basis for further research.